Emmy Noether, one of the leading mathematicians of her time, made vital contributions to theoretical physics and abstract algebra. Her first theorem connected mathematics and physics, showing the link between symmetry in nature and the universal laws of conservation. Noether is remembered for her exceptional skills and contributions to mathematics. 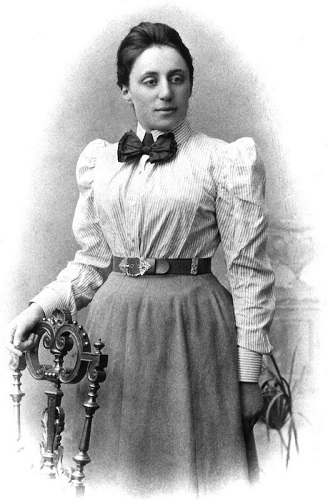 Amalie Emmy Noether was born on March 23, 1882, in Erlangen, Germany. She originally studied at the Municipal School for Higher Education of Daughters in Erlangen with the intention of becoming an English and French teacher. However, Noether’s strong interest in mathematics led her to pursue higher education instead. She continued her studies at the University of Erlangen, where her father taught as a math professor. Emmy Noether. Image in the public domain in the United States, via Wikimedia Commons. At the time, women could only audit courses and needed the permission of the instructor. After auditing classes from 1900 to 1902, Noether was granted an honorary degree; essentially, the equivalent of a bachelor’s degree. In 1903, she briefly attended the University of Göttingen, where she attended lectures by prominent astronomers and mathematicians such as David Hilbert. In 1904, the restrictions for female students at the University of Erlangen were lifted and Noether returned as a graduate student. 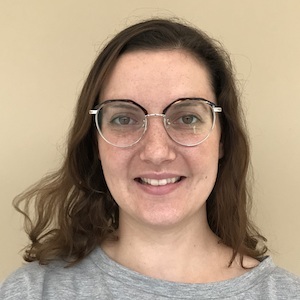 She was accepted as a PhD candidate by Paul Gordan, known for his work on invariant theory. After making strong progress in this field (a precursor to her future achievements), she went on to earn her doctorate in 1907. Though the attempt to bring Noether on as a professor was unsuccessful, she remained at Göttingen as a volunteer instructor. Her collaborations and endeavors at the school brought her to the theories and discoveries for which she would later be known. 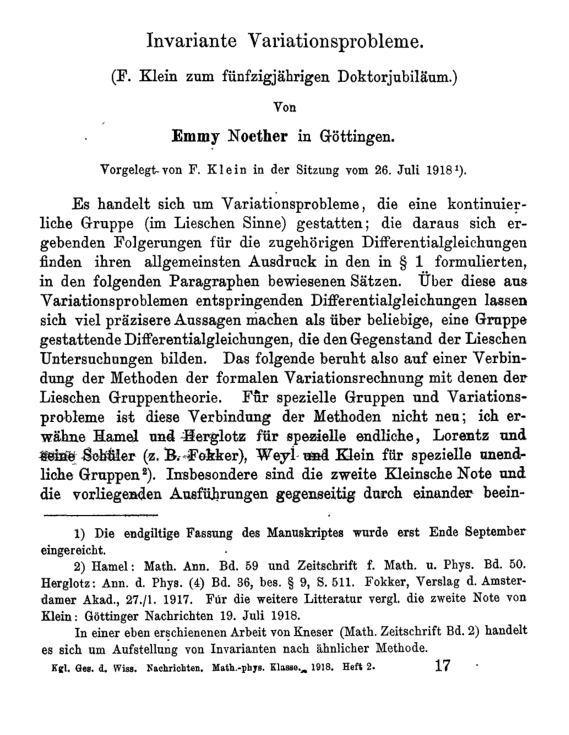 In 1915, Emmy Noether joined the Mathematical Institute at the University of Göttingen, where she worked with Hilbert and another colleague, Felix Klein. They focused their efforts on Albert Einstein’s recently published general theory of relativity. Hilbert and Klein saw an issue with the theory, believing that it violated the laws of the conservation of energy. This is where Noether employed her previous work on invariance. While deliberating over Einstein’s general theory of relativity, Noether theorized that the energy of an object might not be conserved locally, but the total amount doesn’t change during a transformation. Her theorem states that for every symmetry, there is a corresponding conservation law, showing that the conservation laws of physics are rooted in mathematical symmetry. The first page of Noether’s theorem, called “Invariante Variationsprobleme”. Image in the public domain in the United States, via Wikimedia Commons. Noether’s solution became her first published theorem, now known as Noether’s theorem. Since its creation, the theorem has been used to direct further study and help physicists throughout history develop theories of the natural world. Emmy Noether’s theorem is not the only contribution she made to the scientific community — and some mathematicians argue it is not even her most significant. In 1920, she began developing abstract algebra, which examines how mathematical concepts relate to each other and how they construct mathematical structures. At the time, it was a new approach to the subject and led to breakthrough concepts, such as ideal theory. Today, abstract algebra is essential to the field of mathematics. 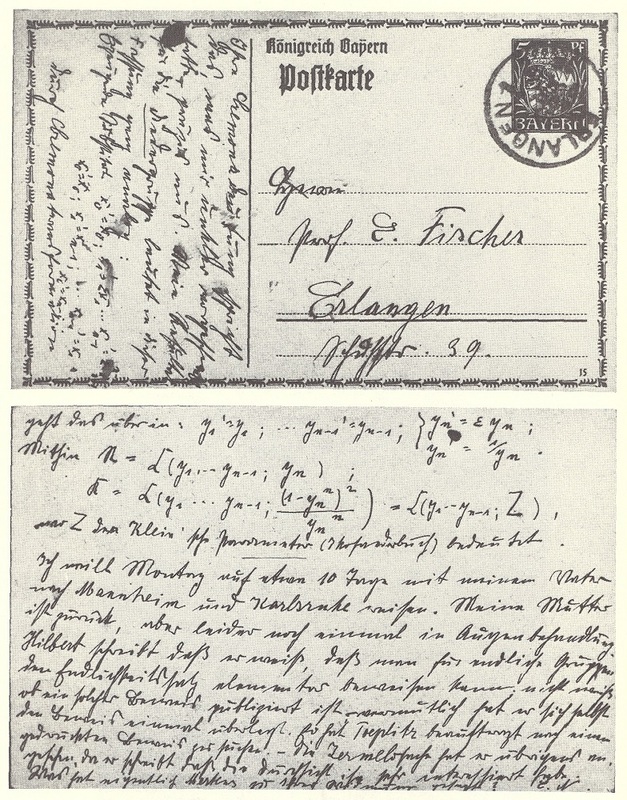 A postcard from Emmy Noether to her colleague Ernst Fischer, discussing abstract algebra. Image in the public domain in the United States, via Wikimedia Commons. In honor of Noether’s work in abstract algebra, many mathematical objects are named after her, including the Noetherian ring. Today, Noether is recognized as the “mother of modern algebra”. Due to increasing tensions in Germany in 1933, Emmy Noether and many other Jewish professors were dismissed from their positions. Noether moved to the United States, where she became a visiting professor at Bryn Mawr College and gave occasional lectures at Princeton University. Though she worked without a title or pay for most of her career, Noether is remembered for her impact on the world of math and physics. Let’s wish Emmy Noether a happy birthday!